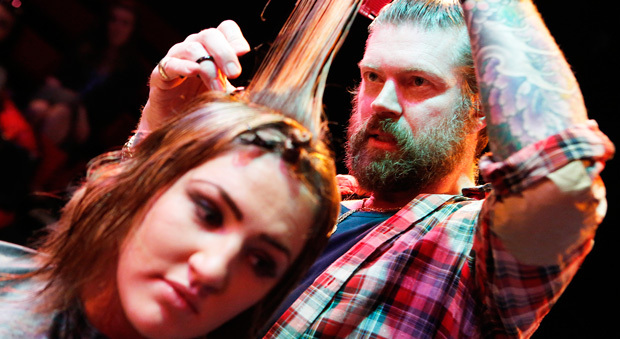 Hairdressing students at Blackpool and the Fylde College were given a master class by celebrity stylist Lee Stafford. Around 70 level one, two and three hairdressing students and apprentices were invited to drop-in and ask Mr Stafford for tips and advice, while he prepared student models for the main cutting and finishing demonstration. During the demonstration, which was attended by 90 students, college staff and local employers, Mr Stafford showed how to create some of the latest styles — including the disconnected bob, where hair is left longer at the front than the back. Davina Doherty, hairdressing lecturer, said: “It was extremely inspiring and motivational for our students to spend the day learning from a top industry expert. Mr Stafford’s career took off in 1997 when he won the Men’s British Hairdresser of the Year award. He gained national fame after appearing on the BBC TV series Celebrity Scissorhands in 2007, where he trained celebrities such as Tamara Beckwith and 1980s pop star Steve Strange to cut hair. Cap: Model Lucy Fisher, aged 18, has her hair cut by Lee Stafford during the cutting and finishing demonstration.